Published on July 27, 2018 by Posted by Lake Ontario Waterkeeper. Kingston Mayor (left) and Patrick Downie (right) cross the bridge from Breakwater Park to the new Gord Edgar Downie swimming pier. July 26, 2018. Photo by Swim Drink Fish. Kingston, Ontario -- The Gord Edgar Downie Pier was officially unveiled during the re-opening ceremonies of Breakwater Park yesterday. Hundreds of attendees came to experience the new Breakwater Park features, including a new promenade, pedestrian bridge and shade structure, pier upgrades, steps and seating, shoreline works including an upland beach, landscaping and tree planting and accessibility improvements. Opening ceremonies began with remarks by Mark Gerretsen, Member of Parliament for Kingston and the Islands, Mayor Bryan Paterson, Mark Mattson, Waterkeeper and Swim Drink Fish President, Tamara Rebanks, Chair of the Conservation Committee, The W. Garfield Weston Foundation, and Patrick Downie, Gord Downie’s Brother. Members of The Tragically Hip and the Downie family were also in attendance. The Gord Edgar Downie Pier honours one of Kingston’s most cherished citizens, Gord Downie. He was also a board member and mentor to Swim Drink Fish. Having lived across the street from the pier, Gord became an advocate for accessible water in Kingston and all of Canada. Including Gord’s father's name, Edgar, was a fitting tribute to the Downie family, said his brother, Patrick Downie. The renovations were supported by $500,000 in funding by The W. Garfield Weston Foundation, through Swim Drink Fish’s Great Lakes Challenge initiative. Event day festivities included a Gratitude Swim, hosted by Swim Drink Fish. Swim Drink Fish is a Canadian charity working for a swimmable, drinkable, fishable future since its launch in 2001. By blending science, law, education, and storytelling with technology, Swim Drink Fish empowers millions of people to know and safeguard their waters. "The restoration of the Gord Edgar Downie swimming pier and Breakwater Park is one of the highlights of my career. It's a testament to the power of community engagement, visionary funders like The W. Garfield Weston Foundation, and municipal leadership. I believe what's happening in Kingston will inspire more cities on the Great Lakes to embrace their connection to water and that we'll have healthier, happier communities as a result,"
The Breakwater Park redevelopment is part of the Kingston Waterfront Master Plan (KWMP). In June of 2017 Kingston City Council voted unanimously to name the renovated PUC Dock after Lake Ontario Waterkeeper/SDF Canada board member and Kingston native Gord Downie in honour of his work to connect people to water. 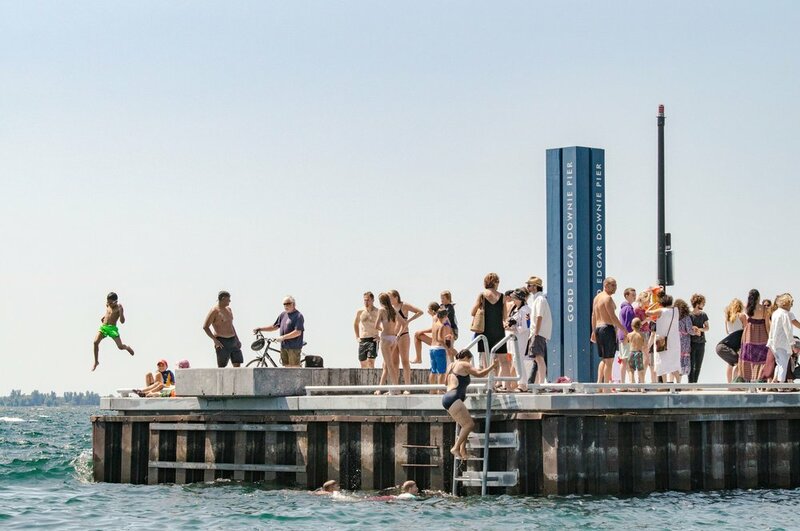 The Gord Edgar Downie Pier is Canada’s first urban natural swimming pier. Residents enjoy the Gord Edgar Downie Pier at the grand re-opening of Breakwater Park in Kingston, Ontario. The pier restoration was made by possible by The W. Garfield Weston Foundation.